A 20-YEAR-OLD woman believed to be eight weeks pregnant has been flown to Bundaberg Hospital after a car she was travelling in collided with another vehicle at 100kmh. 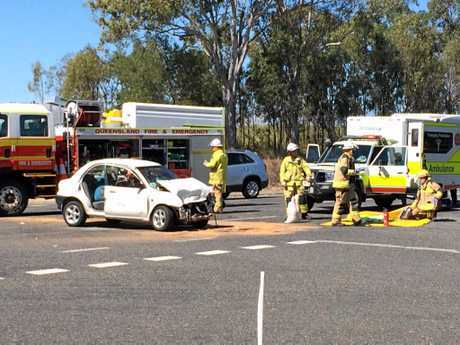 QAS senior operations supervisor Martin Kelly said the woman, travelling in a white Mazda, suffered a fractured upper leg in the crash at the corner of Mittlehauser Rd and the Bruce Hwy. Mr Kelly said there were no signs anything was wrong with the baby and that it was among paramedics' primary concerns when arriving at the scene. The woman was airlifted by Bundaberg-based RACQ LifeFlight Rescue helicopter to Bundaberg Hospital in a stable condition for further treatment. The driver of the Mazda, a 20-year-old man, suffered facial injuries. Mr Kelly said five people were involved in the crash when a Mazda travelling along the Bruce Hwy at 100kmh hit a vehicle in front of it about 10.30am. Gin Gin officer-in-charge Sergeant Tim Marrinan said the Mazda was travelling along the Bruce Hwy behind the other vehicle when the crash happened. "The other vehicle was making a right-hand turn onto Mittlehausers Rd when the Mazda has careened into the rear of the car at 100kmh," he said. The female driver of the other vehicle complained of neck pains and was taken to Bundaberg Hospital for observation. A DRIVER and passenger of a white Mazda have been airlifted to hospital after crashing into another vehicle at 100kmh. Sgt Tim Marrinan talks about crash: A video of two-car crash at corner of Bruce Hwy and Mittlehausers Rd. Sgt Tim Marrinan describes what happened. "The driver and passenger of the Mazda have been taken to hospital. "I believe the driver of the car has been taken to hospital as a precaution." The condition of the patients remain unknown. It appears the Bruce Hwy crash scene has been cleared and traffic is slowly returning to normal. TWO patients are being transported to hospital via RACQ LifeFlight helicopter. A person was trapped inside a white Mazda 121 and emergency crews had to break the patient free from the vehicle. The crash happened at the corner of Mittlehausers Rd and the Bruce Hwy earlier this morning. People travelling in the area are warned to expect long delays. A PERSON remains trapped after a two-car crash. 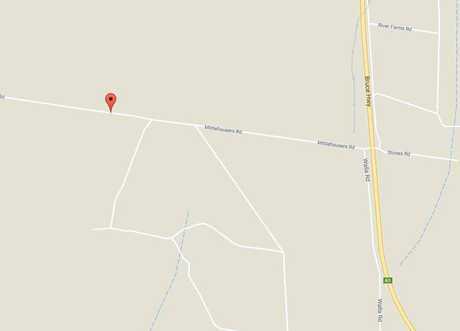 Emergency crews are attending the scene of a two-car crash on Mittlehausers Rd, Wallaville. Early reports suggest there are three people involved, two with minor injuries and one with a leg injury.